Sustainable development accompanied by a clean environment is desirable although many urban councils in developing countries have persistently failed to achieve this. The City of Harare authorities are ceased with the status of household solid waste management service delivery. This study therefore aimed to investigate the effectiveness of the strategies employed by the City of Harare in household solid waste management. To achieve this, structured questionnaires, interviews, observations and focus group discussions were employed in data gathering together with secondary data. The study was conducted in Harare’s low, medium and high-density income suburbs. Findings revealed that organic solid waste constituted the largest proportion of waste generated in Harare and other forms are also generated yet their collection is very minimal. Residents resort to illegal night dumping, resulting in the proliferation of associated diseases. In light of these findings, it was recommended that waste collection entities be capacitated, people be educated on waste recycling, reduction and reusing. A commission be put in place to ensure proper enforcement of waste legislation, effective and sustainable day in running of household solid waste management in the city. Human settlements are facing increasingly complex and formidable environmental problems, particularly in Less Economically Developed Countries (LEDCs). These include water, ground and air pollution. Notable problem is household solid waste whose production has not been matched by an increase in the capacity of municipalities to manage the waste, giving rise to disposal problems . Waste management and disposal seem to be the major challenges in the face of financial, technical and administrative incapacity of developing countries . This waste emanates from both residential and industrial sources, and should be managed in ways that are environmentally friendly, ecologically sound, economically viable, and socially acceptable and without causing health hazards [2-4]. Thus, the strategies employed in the management of household solid waste are of concern especially given the fact that quantities of household solid waste are on the rise and may increase fourfold by 2025 (World Resources, 1996). A study by Tevera found that over 100 people die every year due to diseases caused by improper household solid waste management in Zimbabwe . It is estimated that up to 5.5 million people are at risk of death from diseases that result from poor household solid waste management globally . These diseases can be avoided if proper waste management strategies are put in place . Harare, capital city of Zimbabwe, is at risk to these ever-increasing household solid waste management problems. The Harare City Council is facing household solid waste management challenges. This is because of a number of factors which include among others lack of financial capacity, technical expertise, limited environmental education and increased population numbers. The Harare City Council is therefore facing household solid waste management challenges as it tries to effectively manage household solid waste at low cost, and reduce environmental degradation and deterioration due to improper disposal of household solid waste. Both organic and inorganic waste are produced and dumped haphazardly in Harare . Researches have been undertaken to establish the causes of this poor household solid waste management. However, their focus was not on the assessment of the effectiveness of the strategies employed in household solid waste management. The interested stakeholders seem to be blaming different factors. The government and residents blame lack of capacity by the city authorities, poor prioritisation/ misallocation of funds and corruption while the City fathers owe it to underfunding which inhibits the acquisition of the right equipment for refuse management and lack of cooperation by the ratepayers. Thus, there is need for new information to improve the effectiveness of the strategies used in household solid waste management. The long-term goal is to propose sustainable and effective household solid waste management interventions that are cost effective, economically and environmentally sound. Strategies have been traditionally recommended for waste minimisation and these are part of the waste management hierarchy and involve reusing, recycling, reducing, avoiding and land filling. This research examines the effectiveness of these conventional waste management strategies. This is against the background that major challenges are faced in household solid waste management in Harare and of note is the identification of suitable sites for and selection of methods of household solid waste disposal, lack of proper and adequate compactors and skilled personal, environmental education and financial resources. Waste is classified as either organic or inorganic. These are further divided into two categories which are hazardous and non-hazardous waste. This classification is based on the potential of waste to cause damage or harm to living organisms and the environment in general. Waste emanate from different areas such as industrial, domestic and commercial sites and these provide different benefits and pose various problems to the environment if the strategies used to handle them are not effective . These types of waste require a different strategy of management to minimise their negative effects on the environment. In Harare all waste is dumped irrespective of its origin, nature and potential impact to the environment and without following proper processes recommended for waste disposal. The proper conventional ways of managing solid waste include the Integrated Solid Waste Management (ISWM) and the 3Rs of waste management (Reduce, Reuse and Recycle). Internationally known principles of waste management are the only noble way to go. If the environment is to be protected there is need to completely avoid waste generation; this can be done by avoiding the use of non-biodegradable products and encouraging the use of biodegradables. In cases where the population cannot avoid the non-biodegradables, it is wise to reduce whatever waste being generated. This reduced waste should be reused and be recycled in order to reduce the sprouting of waste dumps. This includes the re-using of waste that can be used again before throwing it away as waste. In cases where recycling and recovering of waste fails, it is environmentally proper to treat all waste to avoid releasing poisonous substances into the environment. After treatment then the waste can safely be disposed into a landfill and not a dumpsite where it is not properly managed. The aggregate of subjects regarding which inferences were made, was drawn using socio-economic status of the residential locations. The population was drawn from residential areas of Mbare, Budiriro and Highfield (high density), Milton Park, Waterfalls and Westlea (medium density) and Borrowdale, Mandara and Gunhill (low density). The study adopted a mixed method approach involving triangulation of qualitative and quantitative designs. In this study the qualitative design depended on open ended questionnaires, interviews, focus group discussions and observations. The quantitative design focused on hypothesis testing through statistical testing and data analysis to establish relationships between variables such as household size and amounts of waste generated. It therefore depended on closed ended questionnaires, field measurements and statistical tests of relationships between variables. 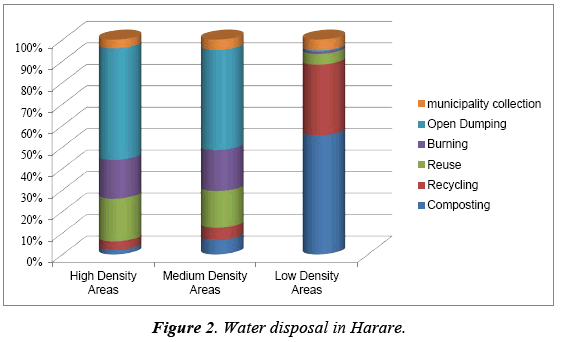 Secondary data was obtained from the City of Harare Department of Waste Management, Ministry of Health and Child Welfare, Environmental Management Agency (EMA), Ministry of Local Government and National Housing, Ministry of Environment and Natural Resources, National Social Security Authority (NSSA) and other environmental institutions in Harare. An in-depth analysis of wastes at the dumpsites shows that there are mainly organic and inorganic wastes. Organic waste, included substances such as food leftovers, papers, wood and plant remain. These are also regarded as compost materials because they can easily decompose. The inorganic materials include glass, metals, plastics, electronic materials and others. The major objective was to ascertain the composition of waste in each residential area and examine the sorting of wastes by the households themselves as they dispose of their wastes and to evaluate the compliance of waste disposal by households to the environmentally ideal standards of sorting the wastes . The solid waste generated by households in Borrowdale, Mandara, Gunhill, Waterfalls, Milton Park, Westlea, Mbare, Budiriro, and Highfield consists largely of organic waste such as food leftovers, and wood. Inorganic waste contributed a smaller percentage of the total waste than organic waste as shown in Table 1. Table 1. Composition of weekly household solid waste by residential areas (% by mass). Low density suburbs have an average of 831 people per suburb and an average of 166 households of five people each. It produced an average of 731.3 kg per capita per day of household solid waste per week. Each household therefore produced 4.4 kg per capita per day of household solid waste per week. Papers contribute the largest share of waste generated which is 32% to 35% (234 kg to 256 kg per capita per day) of total waste in low density residential areas of Borrowdale, Mandara and Gunhill. The papers include old newspapers, containers of washing powder, invoices, books, flyers, mobile phone airtime cards and receipts. Another significant proportion of household solid waste is in the form of food leftovers and plastics which contributed between 15% (110 kg/capita/day) and 18% (132 kg/ capita/day). Organic matter forms the larger part of household solid waste generated in the low-density areas of Borrowdale, Gunhill and Mandara. This may be due to their high incomes which enable households to spend more than low income earners in the high density residential suburbs as also noted by Tevera . However, waste such as wood and others here referred to as miscellaneous waste formed a significant share of the total waste in these low-density areas. An insignificant proportion of waste was made up of yard waste, glass and metals which contributed between 1% (7 kg/capita/day) and 5% (37 kg/capita/ day) of total waste. Similarly, in the medium density suburbs a larger percentage of waste comes from organic waste such as papers, food leftovers, wood and yard waste. This is probably due to relatively higher purchasing power by households. On average, each household in the middle density areas (Westlea, Milton Park and Waterfalls) had lower amounts of glass, metals, electronic and other waste. These inorganic wastes contributed less than 17% (124 kg/capita/day) but at least 10% (70 kg/ capita/day) of the total volume in the medium density suburbs. In high density suburbs which has an average total population of 12065 per suburb and also an average of 2413 household of five people each produced and average of 29921 kg/capita/day of household solid waste per week. Which means each household produced 12.4 Kg/capita/day of household solid waste per week. In the suburbs of Mbare, Budiriro and Highfield it was found that about 50% (14961 kg/capita/day) of household solid waste is food leftovers. This is because the high number of households equals a high population which generates more food leftovers. Papers, wood and yard waste constituted between 8% (2394 kg/ capita/day) and 14% (4189 kg/capita/day) each. This could be due to a relatively larger family size per household including children who generate a lot of waste. Yard waste made up the least proportion of waste with not more than 2% (598 kg/capita/ day) in these high-density areas. This is probably due to small stand sizes per household which makes it impossible or difficult to accumulate a lot of waste on small backyards. Electronic waste makes an average of 6% (1795 kg/capita/day) of the total waste generated in high density suburbs. This could be due to buying of low and poor quality electronic gadgets which are not durable and quickly breakdown and this could also explain the inability by residence from the high and medium density suburbs to buy proper and durable electrical gadgets due to lower incomes. Glass waste makes an average of 3% (898 kg/ capita/day), metals 6% (1795 kg/capita/day) and other waste 4 % (1197 kg/capita/day). The bulk of solid waste generated in the low and high-density areas comprises organic matter. Similarly, yard waste constitutes the least percentage (2%) of total waste in both low density and high-density suburbs. The reason for this similarity could be due to differences in waste generation and management strategies and not that because they generate the same mass of household solid waste. However, food leftovers constitute more than half of total household solid waste whereas papers constitute the largest proportion of waste in low density areas with an average of 33% of the total mass of household solid waste. This shows that the bulk of the waste is biodegradable in nature and if not properly managed can cause the spread of diseases such as cholera, typhoid, dysentery as well as the proliferation of flies and odours. The household solid waste in Harare is basically throw away and there is very little recycling. This is shown in Figure 1 which illustrates that there is the generation of waste at source which is collected and deposited at a dumpsite. There is no separation of waste and 90% of the collected waste is dumped without separation at the official dumpsite. Some of the waste is illegally dumped and then the authorities move it to the official dumpsite. It should be noted that only 10% of this generated waste goes to recycling, composting, reusing and other value addition processes. The situation shows that in Harare like many other developing cities household solid waste management is not effective. Figure 1: Household solid waste in Harare. Households in Harare use plastic receptacles. These are provided by the city authorities. However, for financial reasons the authorities do not provide more than one receptacle to enable separation of waste. These receptacles are placed by the gate once a week for collection on the designated day for each particular area, usually in the morning. In cases of breakdown of the compactors, the Council does not collect waste; this problem is further exacerbated by the fact that the Harare city only has 47 vehicles to collect waste from 46 wards as well as the city centre and other shopping areas not to mention other mushrooming illegal settlements around Harare. The plastic bags full of waste are placed outside the gates for collection. If for any reason the authorities fail to collect, the waste will never be kept instead they will find their way to the illegal dumps across the streets. The Harare City Council’s timetable for collecting household solid waste shows that waste is collected every day from Monday to Sunday although it’s done in different locations on designated days. Despite the fact that waste in the subtropics is supposed to be collected at least twice a week the timetable shows that in Harare it is done once a week and not adequately. The indications on the timetable are also unlikely because currently the city has only 47 compactors which save all the residential, industrial and commercial zones of the city. This shows that the collection strategy is not effective as the frequency of waste collection is often compromised due to compactor breakdowns. There is no room for breakdown of any vehicle in the system yet the Director of the Department of Waste Management reiterated that their greatest challenge is the breakdown of compactors. He further indicated that efficiency is reduced by gross underfunding. The Harare City Council is allocated about 20 million dollars from the annual city budget for all their requirements such as salaries, fuel, receptacles, and vehicle maintenance and servicing. This problem is further exacerbated by the fact that the spares for the compactor vehicles are imported from other countries. This shows that the strategies employed in the management of household solid waste in Harare are marred with a legion of drawbacks hence they are not effective. Timetable has no specific times on which the vehicles will be in a given locality. This could help in making follow ups by residents in the event that their receptacles are not emptied. Eye witnesses saw that the collection crew sometimes do not collect garbage from all the residential areas as stipulated on the timetable. This gives an impression that an area has been covered when in actual fact some areas would have been left out. This again supports the findings that household solid waste is collected once a month which has given rise to illegal dumping of waste in open spaces. The timetable is not available for public inspection and does not give specifics as to what action will be taken in the event of a vehicle breakdown. During the collection of household solid waste most plastic bag receptacles break down because the crew sometimes pulls them along the tarred roads thus dropping waste all over the roads resulting in environmental pollution. The frequency of collection ranges from twice a week to once a month. It was found that in high-density suburbs where the household sizes are big, a lot of solid waste was in the form of food leftovers. It was also observed that open burning of waste is common in areas along roads and open spaces where residents dump their household solid waste especially when council fails to collect and residents want to get rid of the waste. This is against the fact that EMA indicated that open waste burning practices contribute to ground level ozone pollution (smog) which can worsen respiratory, heart and other health problems. This can also lead to eye, nose and throat irritation as well as damage of the central nervous system . Compared to this waste infested status of the high and medium density areas it was observed that illegal dumps are rare if any in low density areas. This can be linked to the differences in knowledge, income and ownership of waste receptacles between residents in high and low-density areas. Generally, residents in the low-density areas own receptacles that are big and durable. These are sold by companies such as Bins for Africa and 26 other companies listed in the directory for companies that are into waste management kept by Environment Africa. It was revealed that waste collection in low density suburbs is done more frequently (twice per week) than in high density suburbs (once a week or twice per month). This is, however, not reflected on the timetable. More so, most politicians and policy makers or rather the elite class resides in the lowdensity areas and this explains the mismatch in the collection of household solid waste between these areas. Collection and disposal of household solid waste in the low-density areas is the responsibility of several stakeholders who include the municipality, private organizations paid to collect waste by individuals and individual households’ themselves taking their waste to Pomona dumpsite. This implies that strategies used in low density suburbs are better in household solid waste management compared to the high and medium density areas. This gives the area a generally clean environment dominated by well-cut loan and well-maintained vegetation and outside gate appearance. The general picture is that despite the bigger residential stands (above 800 m2) low density areas are cleaner. The high and medium areas are dominated by waste dumping all over with some dumps less than 3 metres away from houses. In medium and high density residential areas the level of environmental education is generally lower than in the lowdensity areas. This has resulted in over-reliance on council allocation of household solid waste receptacles in the medium and high density residential areas as well as household solid waste collection, yet the council is incapacitated. In fact, according to the Combined Greater Harare Residents Association (CGHRA), one of the main focuses of the 2014 Harare council budget was on refuse collection with about 2 million dollars allocated for zero littering programmes and a total of US$1 500 000 for fuel for refuse collection. This amount, according to the Waste Management department, is too little to sustain meaningful household solid waste management in a city as big as Harare. This is because collection of household solid waste is solely the responsibility of the council especially in the medium and high-density areas. Despite this trust in council by households, various respondents lamented that council collects waste infrequently (once a month) giving residents no choice but to illegally dump household solid waste in open spaces. However, even though the municipality has the major role in waste management in both the low and high-density areas, it is incapacitated due to inadequate compactor vehicles. Currently the Harare City Council has the equivalent of one (1) vehicle per ward. This is because they have 47 vehicles for the 46 wards they must serve. The same vehicles also serve the commercial and industrial zones of the city. The vehicles frequently break down and require spares from abroad and this complicates the household solid waste management as the authorities sometimes do not collect waste as a result of vehicle shortages. The unavailability of the necessary vehicles in adequate numbers makes the bucket–at-night system or night dumping the order of household solid waste disposal and the only option for some residents of Harare. According to the operations manager residents in the high-density areas pay six dollars (US$6) per household and those in low density areas pay nine dollars (US$9) per household toward waste collection. The low charges for household solid waste collection together with the ever breaking down vehicles constitute an ineffective household solid waste management system for the City of Harare. This is because the revenue collected is too small to bring about quick servicing of vehicles in the event that they break down. The conventional and effective waste minimization strategies are recycling, reducing, reusing and avoiding [2,12]. Empirical evidence, cross examination of interview responses and observation show that in high and medium density areas residents do not adhere to these conventional principles. They largely dump and do open burning of waste. This could be due to many factors such as lack of knowledge, failure to collect waste by the responsible authorities, inadequate facilities such as receptacles and financial constraints. Musademba et al. also noted that constrains in waste management were financial and material . Various views were expressed as to the position of adherence to waste minimization strategies in Harare. Generally known waste minimization strategies are not fully adhered to in Harare with 91% of the respondents indicating that recycling, reusing, reducing, avoiding and composting are not employed by residents as the best options in waste management. Only 9% of the respondents supported the use of these conventional strategies. This means that the strategies of waste management in Harare are not near to being effective. Evidence observed on the ground shows that the practices are done in the low-density areas than the high-density areas. It must however be noted that there is minimal reusing and recycling in the high and medium density suburbs, especially with respect to containers that are used to store food stuffs such as salt, butter, sugar and other items. Recycling is generally done at a very small scale in Harare and this is done by unemployed people who pick items from the dumpsites for reselling. The City of Harare recently issued 300 recycling licenses to individuals. This is however a small number and suggests that people still shun waste recycling or it explains that the council had never thought of formalising recycling of waste. In high density areas stands are small ranging from 200 square meters to 400 square meters thus residents do not have enough space to do meaningful composting (Figure 2). If they compost, they are very small composts which consist of mixed rubbish of all sorts of waste showing that they do not have knowledge of the correct types of waste to be composted to ensure proper results. However, in low density areas residents separate waste and appropriately dispose of it; there are gardeners who do composting and work all day to ensure that cleanliness is enhanced. The gardeners at least know what to exclude from the compost and how to dispose of other non-biodegradable waste effectively. Figure 2: Water disposal in Harare. A number of health, economic, social and environmental impacts were highlighted in the research. Some of the household solid waste dumped could be used as raw materials for other industrial activities. This can be through recycling and reusing for example papers, bottles, metal, plastic papers and containers . The aesthetic value of the environment is lost compromising other activities such as tourism, fishing and urban farming. The loss of aesthetic value results in lost national income (GDP) and employment because economic activities such as tourism are compromised as tourists shun waste. Jerie and Tevera also noted that people generally do not want to be associated with waste as these impacts negatively on their health [2,14]. Indiscriminate disposal of household solid waste can lead to environmental degradation and deterioration. Some organic solids decompose to produce odours, leachate and other acids which are destructive to plants, dissolve some important soil minerals and contaminate underground water. This may lead to growth of water hyacinth which kills aquatic life and causes water-borne diseases (cholera, diarrhoea, dysentery and typhoid) if they decompose in water. Some of the environmental problems associated with poor household solid waste management identified by respondents were ecological disruption and resource depletion, toxic smoke, climate change and poor visibility especially when fire breaks out at dumpsites. Findings of this study indicated that knowledge about the causes of climate change is still limited amongst the residents although they can easily identify effects of climate change in their areas. Studies by Mangizvo and Banjo in Nigeria traced the causes of climate change to poor solid waste management in the urban environment; this situation could apply to Zimbabwe because the strategies of waste management in Harare are not effective [15,16]. The City Health Department also indicated that due to poor household solid waste management, incidents of diseases such as cholera, dysentery, diarrhoea and others are frequent and, according to the City Health Director, the diseases are more prevalent in the high-density suburbs. The director made reference to the cholera outbreaks in Budiriro in 2008 and 2009 that killed thousands. The medical director also indicated that cases of about 2-3 people suffering from diarrhoea are reported each week at some of the various council clinics across residential areas. The problem of waste related diseases being common in Harare was also supported by the Ministry of Health and Child Welfare which indicated that diseases related to household waste mismanagement are commonly reported by government hospitals. The first principle of the Rio Declaration puts human beings at the center of concerns for sustainable development. Humans are therefore entitled to a healthy and productive life in harmony with nature. Principle 5 of the Rio Declaration states that in order to achieve sustainable development, environmental protection needs to be an integral part of the development process. In Zimbabwe, Section 83 of the Public Health Act Chapter 15.09 of 1996 states that all local authorities are responsible for maintaining their areas of jurisdiction in a clean and sanitary condition and preventing the accumulation of waste which may be injurious to health. However, the City of Harare is not meeting these requirements since it is failing to collect household solid waste generated by its residents. The Harare Waste Management by-law of 1979, Statutory Instrument 477 of 1979, 127 of 1981 and 197 of 1987 give a description of a receptacle in Section 3 as (I) an approved rounded and lidded container in non-corrugated galvanized sheet metal which is reinforced and welded and is of a capacity not exceeding 0,1 cubic meters or (ii) an approved polythene bag of a thickness of not less than 200 microns and a capacity not exceeding 0,1 cubic meters when filled to within 200mm of its open end or (iii) any other approved receptacle. The same instruments which define receptacles also indicate that it is the duty of council to remove waste from the residential areas. However, the respondents in Harare showed that the council is failing both to provide the receptacles defined in the instrument and to ferry all the generated waste to Pomona dumpsite. Harare waste management department needs an educational department that is responsible for educating households and members of the public on household solid waste management. This also ensures that households that do not have receptacles are provided with such. It is also important to increase the number of inspectors for the purposes of ensuring effective inspection and assessment. This is more important in the residential areas where waste dumping is very common and is witnessed on all open places along roads and open ground. There is also need to ensure that the general number of workers in this department is increased for effectiveness. More so, there is need to increase the number of compactors as this will ensure increased coverage of waste collection and also reduces the time spent collecting waste. The waste collection and management department of the City of Harare should be capacitated to ensure effective household solid waste collection. This can be through: Increasing financial support by inviting private household solid waste collectors since the responsible authority has inadequate equipment and manpower, increasing the human resources requirements to the city of Harare. Enforce laws and regulations on waste management and appoint a Commission that will see to it that household solid waste is well managed by bringing in other players into the field of household solid waste management. These other players could include non-governmental organizations and other independent players who can take household solid waste management as a business by recovering, reusing and recycling of household solid waste. In other words, there should be private-public partnerships to ensure effective household solid waste management which incorporates residents, private waste collection organizations and government entities. Setting up of recycling and reusing commercial-industrial entities which use some of this household solid waste can be an effective strategy since the supply of the solid waste would be met by the demand. For example, a biogas plant can be developed as most of the household solid waste produced in Harare is food leftovers and other biodegradable waste. Jerie S,Analysis of institutional solid waste management in Gweru. 2006;22(1). Katyal T, Satake M. Environmental pollution. New Dheli: Anmol Publications Pvt. Ltd. 2001. Tevera DS, Conyers D, Matovu D. Solid Waste Management Practices in East and Southern Africa. The Challenges and New Innovations in Urban Solid Waste management. 2003. Hardoy JE, MItlin D, Satterthwaite D. Environmental Problems in an Urbanizing World. London. 2001. Zurbrugg C. Urban Solid Waste Management in Low Income Countries of Asia, How to Cope with the Garbage Crisis. 2003. Jerie S. Gender and Solid Waste Management in the Informal Sector in High Density Suburb of Bulawayo, the Dyke. 2011;5(1). IL O. Start Your Waste Recycling Business Technical Handouts: Mt Pleasant. 2007. Tevera DS. The Garbage Crisis Hits Botswana. Kutlwano, Gaborone.1993. Environmental Management Agency. Solid Waste Management: What is Solid waste? 2014. Musademba D, Musiyandaka G, Muzinda A, et al., Municipality Solid Waste (MSW) Management Challenges of Chinhoyi Town in Zimbabwe. Opportunities of Waste reduction and recycling. 2011;13(2). Mangizvo. Illegal Dumping of Solid Waste in the Alley in Central Business District of Gweru, Zimbabwe. Journal of Sustainable Development in Africa. 2010;12(2):110-121. Banjo AD, Adebambo AA, Dairo OS. Inhabitants’ Perceptions on Domestic aste Disposal in Ijebu Ode South West Nigeria. African Journal of Basic and Applied Sciences. 2009;1(3-4):62-66.